Discussion in 'Apps' started by Joel16, Sep 25, 2018. Considering the mess of CyanogenPSP, an old project of mine (@Joel16) that I wrote when I was around 16, I wanted to give my favorite handled one final contribution. CyanogenPSP, may *look good* and *work* well in the most part, however the code base that it uses is a huge horrible mess and I can't emphasize it any further. I'm noticing this now as I approach my final year in Computer Engineering. The file manager in it never even worked, the coding concepts used inside of it is very bad, many duplicate functions that do the same thing, no proper error handling, bad use of resources etc. I wouldn't want anyone to use that as a code base to anything, hence why I want to make one final contribution no matter how late it is. A final contribution with a clean, dev-friendly open source code base. 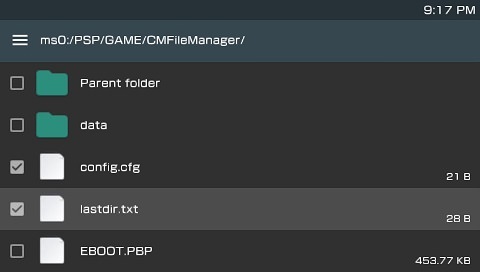 My answer to this CM File Manager PSP - a minimalistic approach to a file manager with a variety of user friendly features. PS. I don't care how late this is, the PSP is an amazing device and I want to do this even if just 3-4 people are interested. 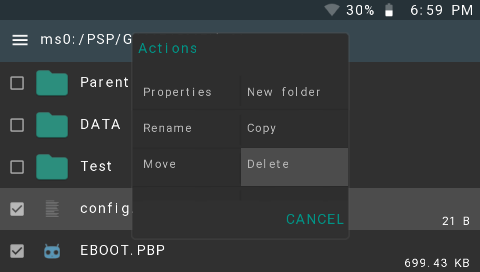 Multi file handling functions for copy/move/delete. Media (music, pictures, reading text files). gatekeeper1122, illtrigger, esc0rtd3w and 18 others like this. Damn it is dusty in here. May our hearts beat forever in 333 MHz. I have one final project that I want to give to this amazing handheld. This time I want it to be user friendly, much cleaner source code and something that will hopefully be well accepted by the community. So true, the PSP community has gone silent now, unfortunately, i would love to see more progress from the developers. Zazenora, gDrive, STLcardsWS and 1 other person like this. Lol, my one and only program for the PSP (CyanoenPSP) - looking back at the code, it makes me cringe. So many horrible programming conceps used, it's just one horrible mess compiled into a program that somewhat works okay. It was a good project for me back in the high school days but looking at it now while I'm almost completed my degree as a computer engineer it hurts lol. So, I want to make one final contribution to my favourite handheld device! Rommy667, Me_TheKing, T.A.U and 3 others like this. STLcardsWS and Joel16 like this. @Joel16 , you graduated? congrats, man! I graduated from college about a decade ago. god I feel old. No I haven't graduated, I worded it wrong but I have a year left before I graduate. gDrive, bitsbubba, STLcardsWS and 1 other person like this. hmm...I may have read it wrong. Here are some better screens. 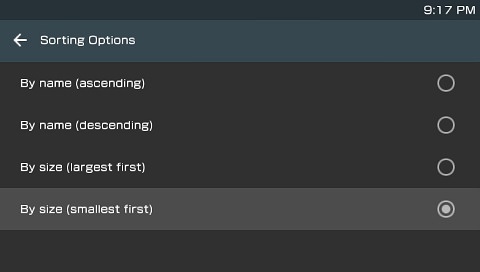 Dark theme toggle and sorting settings have been fully integrated. MixeryMaxe, T.A.U, bitsbubba and 3 others like this. the psp and still getting new homebrew. I still own my system, and it works like a million bucks! that's quality there. gDrive and Joel16 like this. Updated page with some more info as to what you can expect and updated screenshots! nCadeRegal, T.A.U and bitsbubba like this. MixeryMaxe, Me_TheKing, gDrive and 7 others like this. bitsbubba and Joel16 like this. gDrive and bitsbubba like this. That application is very neat! I wish I had that when I have a PSP. Now it is useless in my PSVita. A port to PSVita will be nice. It looks better than VitaShell. Not worth it for VITA. It'll just be another alternative file browser but with a different GUI. Can you add the size of the folder and adhoc file sharing? 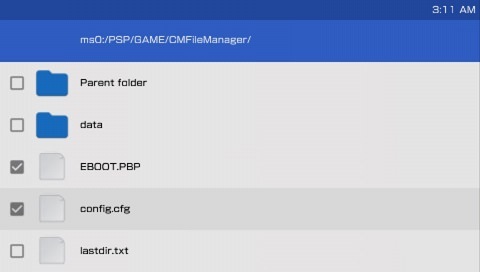 OMG thanks friend, I never knew a good file manager with FTP for my beauty PSP 2000, Friend's anyone have a web navigator or youtube or other for PSP? Can't do the adhoc file sharing. I don't have two PSP's to test this with. I can look into displaying the size of the folder. klx and STLcardsWS like this. 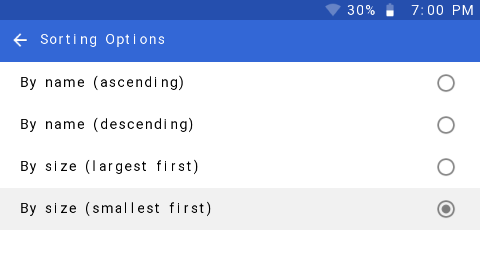 Load app icons into VRAM and swizzle textures. Can now launch ISO/CSO and homebrew. 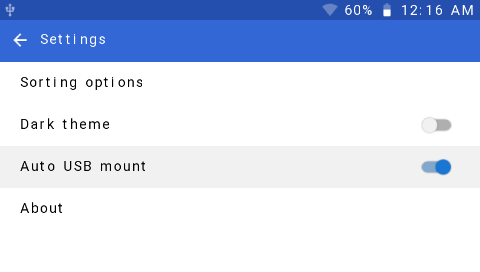 Display storage bar for ef0:/ or ms0:/ devices. 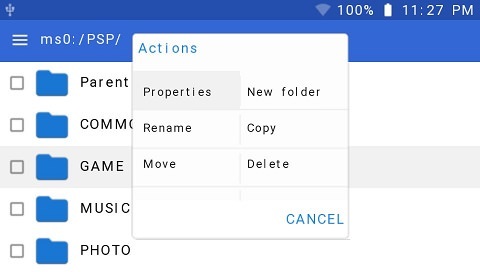 Add option to create files and refresh directory list in options menu. "New folder" option initially has "New folder" set in OSK. "Rename" option has the current file's name initially set in the OSK. Lock power (prevent suspend) during file operations. Make cancel button functional in options menu. 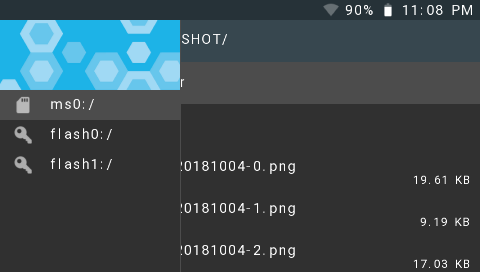 Screenshot path is now changed to /PSP/PHOTO/CMFileManager/. MixeryMaxe, klx and STLcardsWS like this.